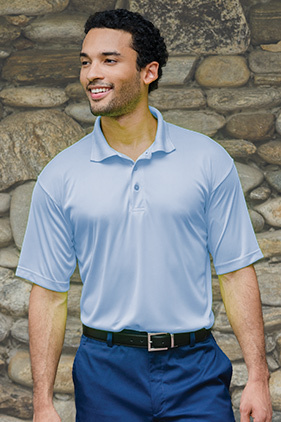 100% polyester 4.5 ounce performance polo with moisture wicking and stain resistant qualities. Resists fading, shrinkage and wrinkling. Raised texture collar and hemmed sleeves. Three dyed-to-match buttons on men's style 360. Ladies style 361 has two dyed-to-match buttons and is cut for her. Both have double-needle hemmed bottom and side-vents. Men's also has extended tail.